Fighting Irish Thomas: Saving Notre Dame: a Knute Rockne recruit? Saving Notre Dame: a Knute Rockne recruit? Afterwards I am running one of the popular columns I run at the top of my blog, for both the Rockne Knute-comers or just those who love to reminisce about "the Rock." Enjoy. Your mom said you were deciding on a college, a momentous decision indeed. But first, let me congratulate you on your insight, not your academic brilliance, for EVERYONE who is accepted to Notre Dame now is a scholar. Instead, I'm happy for the fact you talk about not just a career, but getting married and having kids—something once taken for granted but something so rarely heard of these days, it's nearly brought tears to my eyes...to hear someone realize this is part of your feminine vocation too! But speaking of tears, you certainly must wonder why both Fr. Miscamble and myself, two of Notre Dame's biggest critics, are also first to recommend it—at least to some. Certainly some of our praise is due to the place itself. True, with the endless building expansion, a bit of this is lost, but many people, from agnostics to protestants to fallen-away Catholics, STILL tell me, after visiting the campus, that there is something about this place, something whole and peaceful that they just can't put their fingers on. Meanwhile, I just smile, for I know it's due to the grotto (a replica of Lourdes where just as many miracles occur), the breathtaking Basilica, the many daily dorm chapel Masses (which has given Notre Dame the nickname "The City of the Eucharist"), and the many statues and mosaics (Touchdown Jesus, anyone?) that are there. Add to this the many great teachers and priests still present, plus the spirit of the many great departed teachers and coaches and graduates (some of them who are saints). Then throw in the fact that it has perhaps the only sports team with a worldwide apostolate of spreading Catholicism, you really have something unique. But is it enough? All I can say is there's a powerful, palpable reason why my heart skips a beat whenever I'm driving down to ND and the Dome first comes into view, or why Fr. Miscamble says that "his blood is in the bricks," and could never leave Notre Dame for another. Because of the great witnesses of faith who have gone before and graced this place, Our Lord and Our Lady have blessed it like no other school. On the other hand, it is equally true that infidels have now invaded its walls, and are doing their darnedest to try to take it over—which is all the more reason a bonafide young Catholic lass like yourself who has (in the things that are important) conquered the world (1 John 1:13-14) should come. I've talked to many graduates of Steubenville and other completely orthodox Catholics, and, after ripping Notre Dame (usually justifiably) they listen in silent awe of the great miracles that have occurred at Our Lady's University, and wistfully wonder what it would have been like to have been a student there instead. When you're always singing to the choir, your faith doesn't flower, at least not completely, for it is never really challenged. But at a place where your faith is routinely challenged not only by students but professors who have never really heard the True Faith and AT THE SAME TIME, a place that will not only refresh your faith, but never fail to bring it back stronger than before.....sainthood (if not martyrdom) awaits. Yes many bad (if not evil) professors still lurk there, and the football team (which, believe it or not, an apostolate that once brought more American Catholic boys to the faith than any other factor) is, without a true Catholic coach like Rockne or Holtz, not the witness it once was. But the tide is turning and the battle for Notre Dame—and in turn, American Catholicism as a whole, is being won. This infuriates the devil like little else, for Satan well knows that once Notre Dame is (all the way) back, his grip on this country is lost forever. So you can attend another Catholic college, and save yourself. Or, you can go to Notre Dame—and save the world. Know that we are adding our prayers to yours, so be at peace that, whatever school you decide upon (a win-win situation if ever there was one :)), it is God's will. P.S. Tell your mom to keep in touch, and (if it is God's will), we'll see you all in the fall on some Fightin' Irish football Saturday. Reprinted from Fighting Irish Thomas, 3-31-07. The date was 3-31-31. While there was, on that same date, an earthquake in Nicaragua that killed thousands, the Midwestern newspaper headlines (and indeed those around the world) instead centered upon a small airplane crash in Kansas that killed eight. The first seven would have died unnoticed, but the death of the last passenger (according to the United Press accounts) "shocked the entire world, and business and industry was halted ..." Within minutes, telegrams from the president of the United States, the king of Norway and heads of state from nearly every country, not to mention the presidents of colleges as well as athletes such as Babe Ruth and Jack Dempsey, began arriving. Meanwhile, millions of boys wept. 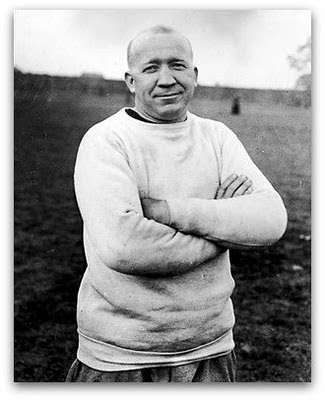 The eighth man on that plane was Knute Kenneth Rockne. If Rockne was merely the greatest coach who ever lived (his 13-season record of 105 wins, 12 loses and 5 ties, still remains the best ever in college football) his death at forty-three would not have brought such grief, nor would his legend have been so lasting. Son of Norwegian immigrants, Rock came to America at the age of five after his father's two-wheel carry-all buggy won an award at the Chicago World's Fair of 1893. Knute learned the game of football in the rough and tumble Windy City neighborhood of Logan Square, under the watchful eye of (I'm not kidding!) "an Irish copper named O'Goole." Knute's dad Lars wasn't keen on college, so Rockne earned his way to Notre Dame (then cheaper than the University of Illinois!) by working in the mail room for five years before entering Our Lady's University, "the lone Norse Protestant invader of a Catholic stronghold," a balding broken-nosed freshman, at the age of twenty-two. There's no doubt Rockne was a decent football player at Notre Dame—his class went 24-1-3 and he was a key component along with QB Gus Dorais of modernizing the passing game, catching half of Dorais' completions in Notre Dame's shocking 1913 35-13 rout of highly favored Army. But he was a better tactician, and even better chemist, and upon his 1914 graduation, stayed on at ND as chemistry instructor, head track coach and assistant football coach—in that order. But when the head coaching job came open, and Rockne chose it over heading the Chemistry Department, most observers thought he was crazy. After 1918, his first season, which WWI shortened to six games (the Irish winning three, losing one and tying two) Rockne went undefeated the next two years and the Irish were crowned undisputed National Champions in 1920. Still, that was not the main story. THAT headline belonged to Rockne's shooting star George Gipp. Gipp, who like Rockne entered college late, was indifferent toward sports—and life—until he met his mentor. Under Rockne's guidance, Gipp, a superb runner, passer, and kicker (George once drop-kicked a field goal from sixty yards away) became the best player (according to Rock) ever to play at Notre Dame. Although Knute could not completely reform George; indeed Gipp continued to skip class, to earn his money hustling pool, and to party (allegedly Gipp caught the pneumonia that would kill him at the age of twenty-five sleeping off an all-night bender in the South Bend snow) Rockne and Our Lady definitely had an effect on him. Gipp, who died weeks after the 1920 season and within days of being named Notre Dame's first ever 1st Team All-American, converted to Catholicism on his death bed, and his life, early death and conversion, coupled with Rockne's own, certainly sealed the legend of Notre Dame football forever. Rock's own conversion to Catholicism came on November 20, 1925, to the delight of his young son, Knute Jr., when he saw his dad also receive the Host during his class' First Holy Communion Mass. Rockne, describing his religion decision, stated "One night before a big game in the East, I was nervous and unable to sleep and went downstairs to the lobby. Between five and six o'clock, I saw two of my players hurrying out [of the hotel]. Within minutes, almost the whole team followed ... and I decided to go with. [While at morning Mass] they didn't realize it, but they made a powerful impression on me ... walking up to the Communion rail to receive ... the hours of sleep they had sacrificed ... I understood for the first time what a powerful ally their religion was to their work on the football field. Later I had the happiness of joining my players at the Communion rail." Truth be told, Rockne's death was not exactly martyrdom, and he probably did not die a saint. He spent too little time with his young kids (he sent his two sons away to boarding school) and too much time on his football job and business promotions (at the time of his death, Rockne was flying to Hollywood to ink a $100,000 movie/newspaper deal). He continually embarrassed the Holy Cross Fathers of Notre Dame by seeking more lucrative jobs while under contract—Rock nearly agreed to terms with several Big 10 schools and actually signed a written contract with Columbia College in New York, needing several lawyers and confessors to extradite himself. And yet, at the time of his death, Rockne had directly (as when he let a suicidal blind man meet his team, and the man became a fan—and believer—for life) or indirectly (as when a priest tried futilely to bring a cynical ex-Catholic back to the Church, until he finally told the man of Rockne's conversion, at which time the man broke down and gave his first confession in thirty years) led many to the faith. But his tragic death at the height of his coaching powers (his last two teams were both undefeated National Champions) no doubt inspired and continues to inspire many in ways his life alone couldn't. And so on the anniversary of his death, let us not only recall the great coach, the man who revolutionized the game and put Fighting Irish football on the map. Let us also remember the humble soul who followed Gipp to the Faith and his players to the Communion rail, that we, like Rockne, realize it is Christ (and of course, Our Lady) that makes Notre Dame football special.